UPDATE (9:30AM – Feb 21): An important typo in the % of existing mobile solutions was fixed in the report. A few weeks ago I conducted the second survey about the State of Mobile Web in Higher Ed to provide the community with some insights on the mobile web in our industry. The first survey was run last year at about the same time. This year again, this online survey was a big success as a total of 281 professionals working mainly in the marketing, communication and web offices of 267 institutions of higher education completed it from January 9, 2012 to February 13, 2012. You’ll find details about the following survey findings (as well as others) in the 10-page executive summary (PDF) including results and charts. 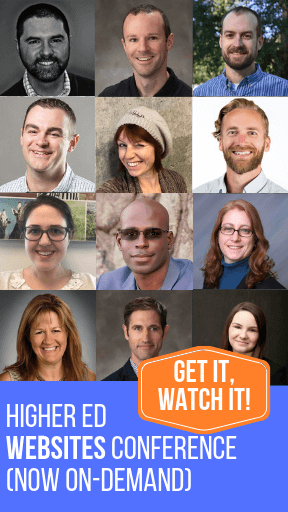 This open and independent research work is supported by Higher Ed Experts (when you buy a webinar series like our upcoming Higher Ed Mobile Summit or you sign up for our Responsive Web Design online course, this is the kind of work you help fund :-). 59% (37% in 2011) of the survey respondents provide a solution (mobile website, accessible website, native mobile device applications etc.) targeting and serving owners of mobile devices. They have implemented this solution within the last year in 72% of the cases. 74% of the survey respondents plan to implement a solution in the future, in less than a year in 59% of the cases. 90% (86% in 2011) of the survey respondents planning a solution will target prospective students. More than 70% of the survey respondents with an existing solution serve faculty and staff. 83% (81% in 2011) of the existing or planned mobile solutions have the goal of supporting campus life by providing a calendar of events, bus schedules or maps among others. More than half of the surveyed institutions identify marketing and branding as a goal for their mobile web solution. 75% of the institutions planning a mobile solutions want to use is for student recruitment. Only 46% of the existing solutions identify recruitment as a goal. 56% of the survey respondents with an existing solution have chosen to serve their mobile web users through a dedicated mobile website, 26% with native applications for specific devices. 15% of the survey respondents have already adopted the responsive web design approach despite the fact that is a fairly new practice in higher ed. 73% of the solutions were developed by staff/faculty, 20% by a higher ed vendor. 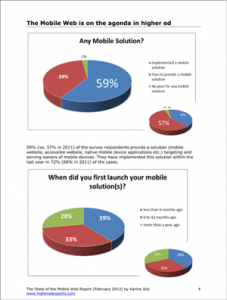 65% (75% in 2011) of the survey respondents with a mobile solution report no budget. Thanks for doing this and sharing! Great insights. I appreciate how you elevated the information beyond that of most “mobile stats surveys” that do little more than find a new way to tell us that there are more mobile devices than toothbrushes in the world (real example). Including the information/insights based on audience and business objectives, in addition to the technology component, make this useful. In my opinion, this also highlights the importance of moving past a reactive approach (build this app here, that micro-site there) into a proactive one that considers an overall strategy for a school’s “digital platform”.